We stopped in a lovely cafe in the village of Durbach the other day for a real treat. New wine, called ‘Federweisser’ and onion cake, called ‘Zweibelkuchen,’ which tastes great as an autumn combination. 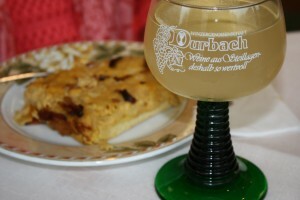 Posted in Germany Tours and tagged cake, durbach, New, onion, tarte, wine.